(CNN) - US Immigration and Customs Enforcement has temporarily closed its field office in Portland, Oregon, as protests continue growing outside the facility. Dozens of people began protesting against the Trump administration's "zero-tolerance" policy outside the office in southwest Portland last week. Some people began putting up tents near the facility's front door and around the building on Sunday and more have joined them since then. Operations at the facility, including appointments with deportation officers, were suspended Wednesday and will continue until "security concerns have been addressed," the federal agency said in a statement. "US Immigration and Customs Enforcement (ICE) fully respects the rights of all people to voice their opinion without interference," the agency said. "ICE remains committed to immigration enforcement consistent with federal law and agency policy." Employees had been escorted out of the building by police on Tuesday, CNN affiliate KATU reported. In a statement, organizers said demonstrators are committed to stay "there until concrete and meaningful action is taken to reunite families." President Donald Trump signed an executive order on Wednesday to end the practice of separating family members who are apprehended at the southern border. However, the order has not changed anything in terms of reunification of undocumented families who had already been separated at the southern border, a Health and Human Services official said. 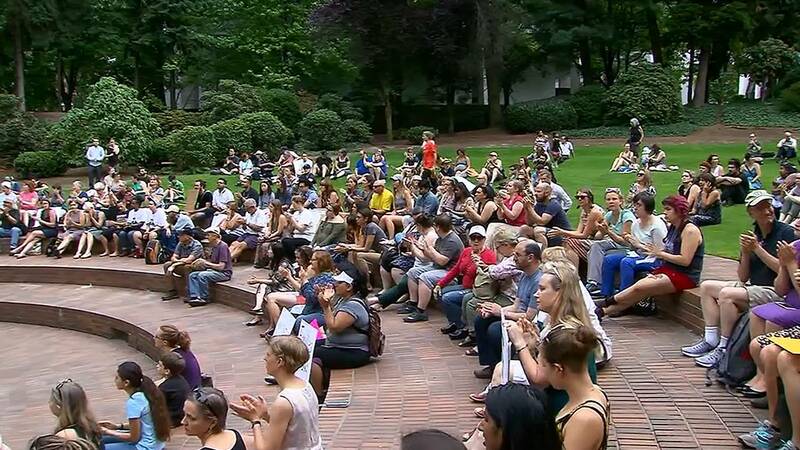 "Many of these migrants are seeking asylum, and separating their children displays the rank cruelty of this policy and exposes the evil intent behind it," organizers, a group named Occupy ICE PDX, said. "Portland has declared itself a sanctuary city, but this facility stands in the way of that," the statement added. Portland Mayor Ted Wheeler, who has criticized the Trump administration over family separations, said he had no plans to interfere with the peaceful protests. "I want to be very clear I do not want the Portland Police to be engaged or sucked into a conflict, particularly from a federal agency that I believe is on the wrong track that has not fully lived American values of inclusion and is also an agency where the former head suggested that people who lead cities that are sanctuary cities like this one should be arrested," Wheeler tweeted. "If they are looking for a bailout from this mayor, they are looking in the wrong place," he added.